The Israeli army's chief rabbinate gave soldiers preparing to enter the Gaza Strip a booklet implying that all Palestinians are their mortal enemies and advising them that cruelty is sometimes a "good attribute". "When you show mercy to a cruel enemy you are being cruel to pure and honest soldiers. These are not games at the amusement park where sportsmanship teaches one to make concessions. This is a war on murderers," Yesh Din quoted the pamphlet as saying. 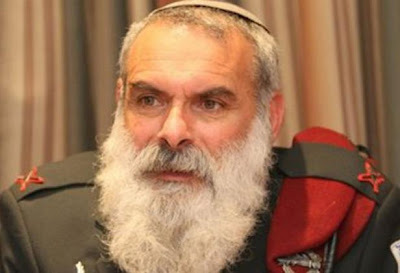 It said the pamphlet quotes at length statements by Rabbi Shlomo Aviner, a spiritual leader of the Jewish settlers in the occupied West Bank who opposes any compromise with Palestinians. "The Palestinians claim they deserve a state here, when in reality there was never a Palestinian or Arab state within the borders of our country," the pamphlet quoted Aviner as saying. It said one urged soldiers to "spare your lives and the lives of your friends and not to show concern for a population that surrounds us and harms us..."
"Kill the one who comes to kill you. As for the population, it is not innocent," the daily quoted the pamphlet as saying. Do I need to remind people about ethics of war in Islam? If I do then see Islam Online here. That's really creepy, isn't it. Right from 1947, there's been a small extremist Zionist minority who have tried (unsuccessfully) to be to Israel what the Nazis were to Germany.